Home > Blog > Farm to Table For Events! Fresh, sustainable food is a popular topic right now and one that is coming up often in the world of events. Wedding couples and event hosts today are not only looking for amazing, delicious food but fresh, organic, farm to table food to serve their guests. 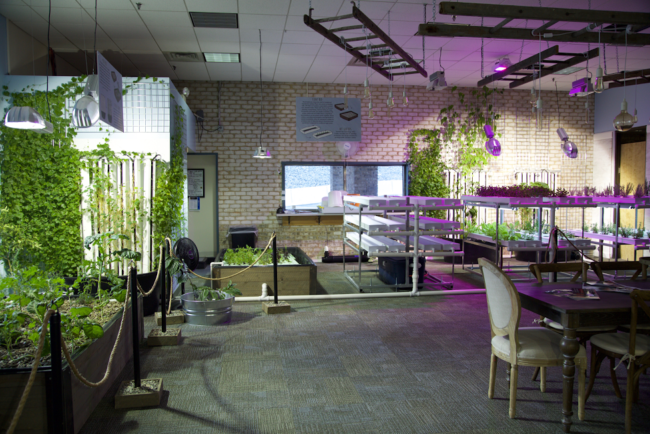 We wanted to bring your attention to the JDK Group who partnered with INTAG, Integrated Agricultural Systems, to grow fresh, sustainable food indoor and year-round. Jen Delaye, CEO of The JDK Group and now COO of Integrated Agriculture Systems, transformed an abandoned bank into an urban garden and event spaced called Ladder & Vine, located in Camp Hill, PA. This location is a hub to grow food for both her catering business and sister restaurant, The Garlic Poet. Both the restaurant and catering business use the fresh produce grown locally from the aquaponic system at Ladder & Vine taking the term “Farm-to-Table” to brand new meaning. The demand for fresh sustainable food is high because many of our clients really care where their food comes from. They care about how their food is grown and how far their food travels to get to their plate. Many people today are living more of an organic lifestyle. There is a definite trends towards more of a farm to table menu at their events. We pride ourselves on making it easier to satisfy the needs of our clients by having this system that doesn’t use pesticides. It also allows for clients to visit and see where and how their food is being grown. On a related note, while we haven’t encountered clients who have food allergy concerns, we are capable of growing and serving a menu that accommodates their needs. Additional Facts about the INTAG’s/ JDK’s aquaponic systems: There are no pesticides, synthetics, or genetic modifications are used. Everything is organically grown, indoors and year round. It uses 90% less water than traditional methods. It is a zero discharge system, meaning nothing from the system is leaving the building and harming the environment. To learn more about INTAG, visit http://www.intagsystems.com/.